I bet I can play tennis better than our picks of the best League of Legends champions. Anyway, enough about me, you came here for the troll who got trolled. Tyler1 is a LoL streamer who’s gained notoriety by messing up games, feeding the opposition by purposely dying to them, and generally disrupting games, even against the pros. If a game didn’t go his way, he would resort to this sort of behaviour, combined with a bit of chat-based abuse. Lovely. Well now he’s been banned. Riot Games announced Friday that Tyler1 would be permanently banned from League of Legends. His account was deactivated and a post explaining the decision on the official forums said any account used by him would also be tracked down and banned. Tyler1 has been known for baiting Riot for their inaction, and this move seems like a bit of a statement from the developer. 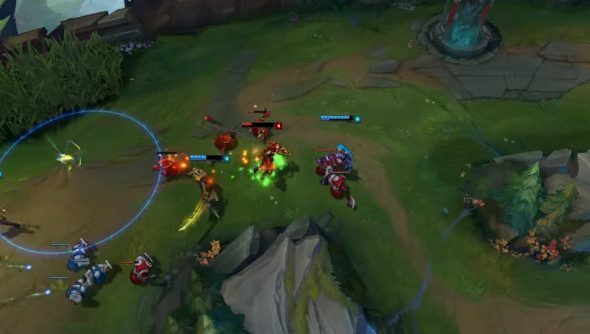 “Instant Feedback catches the most unsportsmanlike players in League, but some people go out of their way to continue ruining games for the community,” wrote Riot Socrates. “Because of a well-documented history of account bans for verbal abuse, intentional feeding, as well as account sharing/purchasing, evasion of sportsmanship systems, and player harassment, we will not allow Tyler1 to hold a League of Legends account, indefinitely. Any account definitively used by him will be banned immediately upon identification. “We know we’re not perfect, and this dragged on too long, but we want you to know when the rare player comes along who’s a genuine jerk, we’ve still got your back.” Ouch. GG, Riot. GG.